Together with our cloud-hosting partners, we offer on-demand access to secure, turnkey, off-site simulation platforms. You can upload your simulation model and go. The variety of computer server choices and ANSYS licensing options means you’ll be able to tap into a solution that is right for your business — no matter its size — and you’ll only pay only for what you need. There’s no need to worry about a lack of computing and licensing capacity, costly in-house hardware upgrades or impeded innovation. In the cloud, the computing power you need is waiting for you when you need it, rather than you waiting for internal computing resources to become available. Tweet "Check out @ANSYS customers sharing their cloud computing experiences in new cloud webinar series." But you don’t have to just take my word for it. Our customers are sharing their cloud computing experiences in our cloud webinar series. These interesting webinars are free to watch on-demand, and you can register for upcoming webinars. In the pharmaceutical and life sciences sector, Juan Pacio, Simulation & Process Engineer at CRB, recently shared how his company uses ANSYS on the Penguin Computing On-Demand cloud platform. CRB is a consulting, design and construction firm with a strong presence in the life sciences industry. The company uses CFD to solve challenges when designing facilities, equipment and processes. To continue on our turbulence theme, I want to share one more customer example with you. 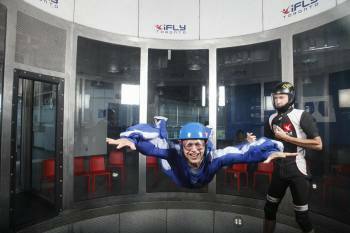 KeelWit Technology, a Spanish engineering company, explained that it turned to the cloud because of a fluctuating project workload combined with the ability to run higher-fidelity simulations of a vertical wind tunnel for skydiving. “Using ANSYS Fluent software and Gompute HPC cloud resources, we reached the accuracy level our clients required for our turbulence and heat transfer calculations. Thus, we have been able to implement real modifications on their equipment and thoroughly optimize our designs in a shorter period of time.” ~José Maria Cancer, the CEO, CFO and a Partner at KeelWit Technology. As the diversity of the three examples above show, different customers clearly have different requirements and practices for their engineering simulations. The full webinar series includes even more use cases for engineering simulation in the cloud—including HPC scale-up and software utilization optimization, job scheduling, collaboration across geographically distributed teams, and to satisfy mobility requirements. Because every customer is different, we give our customers an open choice of cloud platform, cloud vendor, cloud solution, and flexible cloud licensing options. In fact, one of the most common cloud computing questions from our customers is how licensing will work in the cloud. When you choose to run simulation in the cloud, you don’t necessarily need to buy new licenses. You can use the licenses you already own, purchase new licensing for the cloud, take a hybrid approach, or choose to pay per use for on-demand bursts to the cloud. To learn more, watch our webinar series showcasing cloud-hosting partner solutions.